hile JB slept off our post-Yagi-san day, I slipped down to the lobby for any information on how we could spend our final full day. While there were no pamphlets anywhere, I did find a nice guide book in the gift shop (which I cheaply flipped through). In its pages, I did find something about the “Kyoto International Manga Museum”. And, the hell! It looked like it was a block from our hotel! When the wife rose from the dead, we decided we’d scope it out on the way to dinner. Of course we would. So we angled our way over to that district, left the main drag and started poking about the back-alleys of Kyoto. 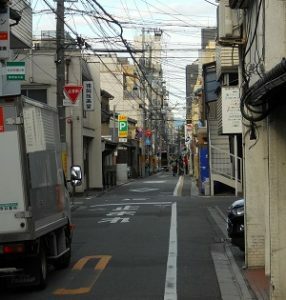 An explanatory note – Kyoto back streets are one way single-lane alleys. They have iffy sidewalks (or painted suggestions). Between their irregular power poles and garbage cans, pedestrians and cyclists and speeding taxis (and dog-walkers and scooters) going every which way, and the fact that night was falling and they are poorly lit, well, it’s a challenge (and I’m from killer-car Orlando). Yes, imagine every form of transportation outside of submarines and jetliners vying for the alley-way and you’ve got an idea. And there are JB and Robert, wandering like rubes up and down these sidestreets, unable to find this museum and within an ace of getting squashed. Finally gave it up and popped into a manga bookstore on the main street we’d visited the day before. Found a salesgirl that spoke very broken English and asked if she knew about the museum. “Hai! Hai!” She tried to explain it but I couldn’t follow. 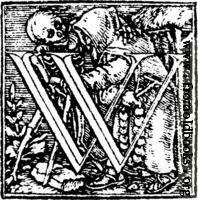 Then, an idea. Whipped out our local street map and asked her to point it out. So after embarrassing America in the international arena just a little more than it already has been, we decided we knew close enough where it was and would go to dinner instead. It was a short hop over to the Nishiki Food Market, a covered alley (bared to cars, thankfully) and loaded with all sorts of food shops. It was a groovy place, all narrow and Asian and perfect if you had a fedora hat and a five-o’clock shadow. Yes, lots of food but mostly small stuff, you know, stand-n-eats. Finally we found a beef shop that had upstairs seating and had a pair of beefy/bacony burgers and two bottles of coke, sitting at the window and watching the people pass by, some of them stopping to buy (literally) squid-on-a-stick across the way. No thanks. 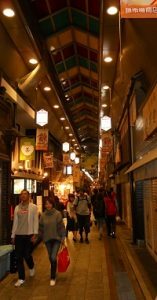 Once we were done, we moved through closing shops (they were shutting up at 7pm on a Saturday night – I didn’t understand that), we figured to go one block south to Shinjo Dori street (the lit commercial area) and head home that way. Relying on my unerring sense of direction, we entered one of those hair-raising cross-streets and walked a short distance. And more distance. And even more distance. After five blocks, even I had to admit that we’d gotten ourselves lost in Kyoto. We stopped in a small coffee shop and asked directions (turns out we’d turned the wrong way out of the Nishiki Food Market and were heading north rather than south). Before leaving (and as a show of thanks for the navigational tip (and because we really wanted ice cream)) I bought a pair of coffee-flavored ice cream cones (that were much better to eat than to describe). From there, it was a quarter mile down the narrow street to the main drag, dodging bikes and taxis and ninjas. JB and I did poke around a bookstore/anime/hobby shop for an hour. Saw original art for Fullmetal Alchemist on the wall and some Legend of the Galactic Heroes game miniatures. After that, we walked home through the massed strollers and almost got knee-capped by a yakuza in a purple pimp car. In the hotel, spoke with the front desk about figuring out the bus system (JB wants to see the Ryonji Temple tomorrow, and with her foot problems and my WTF-hernia, we’re looking at a very interesting day). Fun Fact: I’m told that Japanese have small locks on their front wheels of their bikes. Well, I didn’t see any but I’m not sure what I was looking for. I did see mothers scooping their children out of their baskets and going into shops, as did salarymen with briefcases, with no fumbling for keys. I saw standard bike locks on maybe one-in-ten bikes. As we would find out in this foreshadowing way, the Japanese are far more honest than westerners.